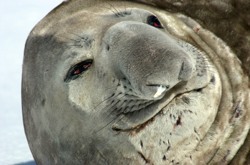 Genetic analysis has shown that 7500 years ago elephant seals successfully adapted to a global warming trend, raising hope they could do the same in the current period of anthropogenic global warming. According to Mark de Bruyn, a molecular ecologist at Bangor University in the UK, the giant seals were able to chase the receding ice into the interior of Antarctica on the Victoria Land Coast and, once there, they got down to business and multiplied relatively quickly. When the warming trend reversed and cooling began several thousand years later, the seals turned around and went from whence they had come, some even returning to the island from which their ancestors had originally migrated. Supporting the research is the discovery some years ago of elephant seal hair, skin, and other remains on the Victoria Land Coast, a region bordering the Ross Sea that today is barren and covered in ice year-round.